This printed circular letter is addressed "to the Friends of Freedom." In it, J. E. Snodgrass expressed his antislavery sentiments and claimed he knew about slavery first hand as he had been born in the South. He also promoted the activities of the New York Kansas League which he described as a "philanthrophic association" to aid emigration to Kansas. 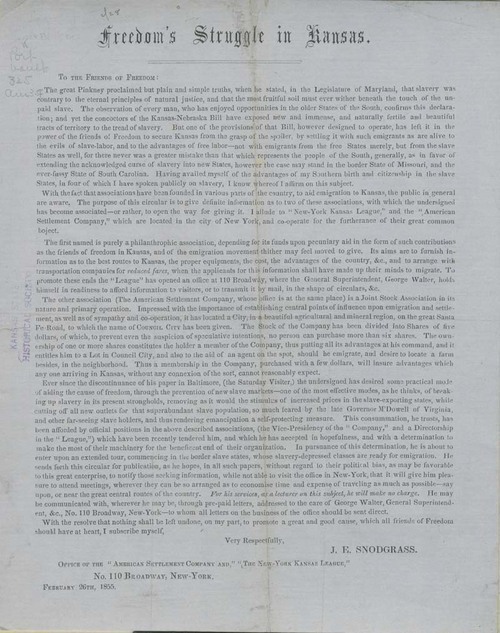 The document also discussed the American Settlement Company which was a "joint stock association" that promoted the settlement of free state supporters at Council City, Kansas Territory (later Burlingame). He closed with antislavery statements and offered to give free lectures on the topic. He was located in New York City at the time the document was printed.